Celebrate new season potatoes this summer. 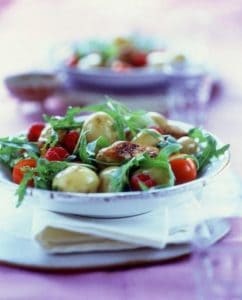 Choose potatoes for boiling and make into a salad with other fresh New Zealand grown vegetables. Look in the recipe section for more great potato recipes – be sure to choose potatoes for their end use; boiling for salads and baking for roasts and mashed. Look for the labels on the potato bag. Enjoy. Place potatoes in a pan and cover with water. Simmer for 12-15 minutes or until tender then drain and allow to cool. Mix with tomatoes, cucumber and rocket. Meanwhile heat the first measure of oil in a large frying pan. Add the chicken and stir fry for 8-10 minutes or until cooked through and browned. Remove from heat. Toss into the salad. In the frying pan, heat vinegar, honey, oil and bring to the boil scraping to remove pan juices. Pour over salad and toss well.